← Does Environment Contribute to Food Choices? 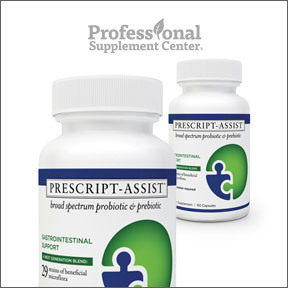 Professional Supplement Center now carries professional grade Prescript-Assist™ Broad Spectrum Probiotic & Prebiotic. This balanced proprietary formulation of 29 symbiotic probiotic species provides a matrix of highly resilient, inherently viable microbiota that have been clinically shown to promote a healthy gastro-intestinal environment. Commonly referred to as “spore formers,” these specially selected beneficial organisms are naturally adapted for survival in the GI tract and mimic the natural flora found in traditional and Paleolithic diets. Prescript-Assist™ provides optimal digestive support and maintains a normal balance of gut microorganisms to help to alleviate uncomfortable gastric distress. Shelf stable without refrigeration and supported by peer-reviewed clinical studies, this next-generation proven probiotic replenishes heathy beneficial microflora, promotes bowel regularity, relieves occasional indigestion, nausea, abdominal discomfort and bloating and supports immune health, overall wellness and vitality. Prescript Assist™ Broad Spectrum Probiotic and Prebiotic – This gluten and dairy free, vegan pre- and probiotic formulation is perfect for travel, during times of high stress, after prolonged antibiotic use or for anyone wishing to ensure a thriving and well balanced intestinal environment. For questions about Prescript Assist™, please call, email or visit Professional Supplement Center. This entry was posted in Home and tagged Prescript-Assist, Prescript–Assist™ Broad Spectrum Probiotic & Prebiotic, Professional Supplement Center, Vitamins and supplements, www.professionalsupplementcenter.com. Bookmark the permalink.